This seems to be a common mistake that most road riders make, and I was certainly guilty of it. It seems that when we start out, we expect it to be hard to turn over the pedals so we tend to use a gear that challenges our legs. What you actually do is fatigue your legs, and make it harder to ride long distances. Over time you learn to ‘spin’ your legs more, and increase your cadence (pedal revolutions per minute), saving energy while still keeping up with the pack. When you break it down, the gears and brakes on a bicycle are a pretty simple mechanical system and like all mechanical systems they are not perfect. So if you gears jump occasionally, or your chain comes off, or you hear a rare clunk, you don’t need to be alarmed. Please note that I used the word ‘occasionally’. If your bike does any of these things over and over again, then you need to take it to your local bike shop to be checked out, but occasional noises are perfectly normal. In fact, you’re probably the one that caused the problem with a rough gear change. When I first started riding a road bike I regularly got a greasy chain ring mark on my right leg from pressing against the chain rings on my bike. I’m not sure how I did it, but it must have been from leaning against it while I was standing over the bike. It certainly didn’t happen while I was actually riding the bike. Over time I broke the habit, but you could skip this one altogether if you’re aware of it. Like many newbie cyclists I was reluctant to show the world my curves in such tight fitting garments. I remember being horrified when someone told me you didn’t wear undies under your cycling knicks. 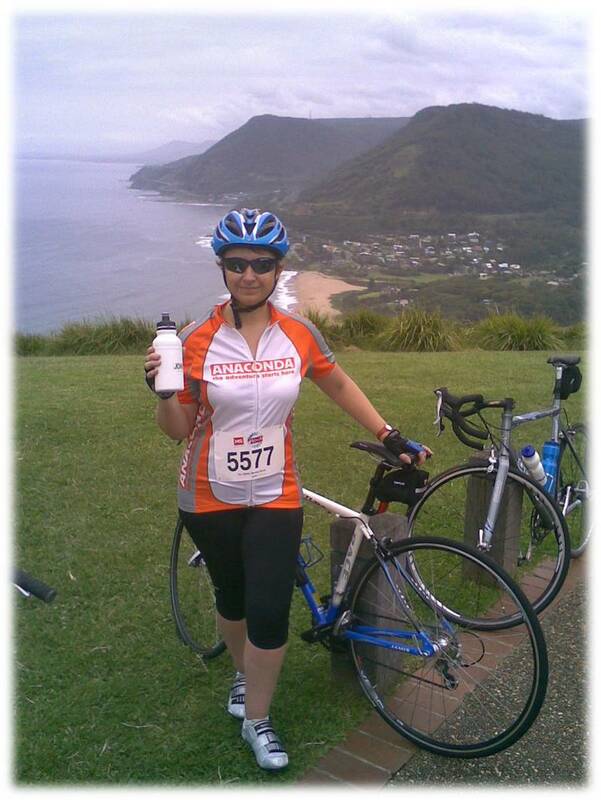 This photo shows me in the Gong ride, just one month after I started riding, I’m wearing the biggest cycling jersey with three quarter knicks. The jersey was a freebie and I felt it covered me well. The knicks were cheapies, and I loved that they covered my knees, but the rest of them was pretty ordinary. I started riding with a second hand helmet (seen in the photo) and plenty of cheap gear like gloves and glasses. The old adage that ‘you get what you pay for’ is very true when it comes to cycling gear. I should have valued my head more, and bought myself a new helmet from day one. Thankfully that blue hand-me-down never got put to the test. You don’t have to go out and buy heaps of expensive gear, but buy a small number of quality items, and you’ll have them for years. This is one of my favourites. You are much better than you think you are. I was lucky that I had a fantastic mentor (my partner Phil) who convinced me that I could ride a bike much further than I thought I could. Within the first six months of riding I completed the Spring Cycle (55 km), the Gong Ride (a hilly 60 km) and the JDRF ride (a very hilly 80 km). So don’t be afraid to test yourself, and sign up for a few organised rides that will push you along. So there’s my six rookie mistakes female road cyclists make. Have you got some others to add to the list? Share via comments or the Women Who Cycle Facebook page. Next Post:Help – Will cycling make my thighs bigger? To add to your underestimate one – I find many women starting cycling are reluctant to ride with people better than them, at fear of holding them up (as generalisation, many men Do not hold back as much in that regard!). You get better by riding with people better than you. Don’t worry about holding someone up a minute or two after a hill, we’ve all been there, and (most) are willing to help other get better too (and if not, why should they benefit from your company). Talk to your riding mates, honestly, they will love to work out a ride for you to come along with them, and help you improve! Even though your head is covered with a helmet and your eyes covered by your sunglasses, beware. Your nose is totally exposed to the sun. Use sunscreen, no matter what the sky is like. I didn’t and neither did my husband. Both of us have had skin cancer on our noses.